Take Provincial Route 420 West. Provincial Route 420 W becomes QEW. Take exit 44 - Service Road towards Niagara Street. Stay straight to go onto Dieppe Rd., pass traffic light on Welland ave. Take Niagara Street ramp on the right hand side. Turn Right onto Niagara Street. Prepare to turn left at the 4th traffic light - Linwell Road. The clinic is at the corner of Niagara Street and Linwell Road. Take QEW towards Niagara. Exit on Niagara Street/Service Road. Exit 44. Keep Right at the fork in the ramp. Stay straight to go onto Dunlop Dr. Turn left at the traffic light onto Niagara Street Prepare to turn left at the 5th traffic light - Linwell Road. The clinic is at the corner of Niagara Street and Linwell Road. Welcome to Maplewood Dental. Our office presents a comfortable, relaxing, and friendly environment for the youngest to the greatest grandparent. Our top priority is to offer you and your family with attentive, individualized care. To learn more, schedule your next appointment with Dr. Salame. 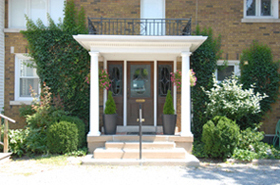 Maplewood Dental © Copyright 2015 - St. Catharines. All Rights Reserved. Website design by: Mick-Mar Inc.